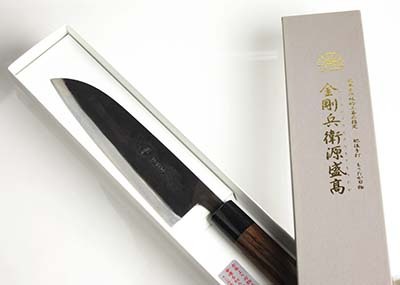 Company Name: MORITAKA HAMONO Inc.
Give your life an edge with Our Long-Lasting Super Sharp Knives! MORITAKA HAMONO has been producing swords for over 700 years. To preserve this ancient tradition, our master swordsmiths, titled Kongohyoe Minamoto no Moritaka (金剛兵衛源盛高), continue to handcraft knives and swords that samurai would be proud of. The outstanding quality of our blades is established by using a combination of a steel core and iron cladding. The steel core gives our knives razor sharp edges, while the iron cladding ensures durability that surpasses any mass production knives. 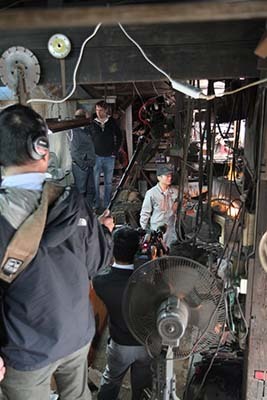 We use only the best “Aogami Super Steel” (AS) and forge it with high quality iron. Our extensive knowledge and experience regarding the properties of these high quality materials allows us to exploit the full potential of these steels, resulting in the production of a superior knife. MORITAKA HAMONO was founded in 1293 during the Kamakura Period by Kongohyoe Minamoto no Moritaka (金剛兵衛源盛高), who was the head swordsmith for the Buddhist priests at Mt. Homan in Dazaifu, Fukuoka. His descendants then followed in his footsteps in the same city for 13 generations. In 1632, our family followed the Higo Daimyo Mitsunari Hosokawa (the feudal ruler of the Higo region) and moved to Miyaji-machi, Yatsushiro City in Kumamoto. For another 13 generations in this city, we forged swords for Buddhist armies, the Daimyo’s army, and also for the Daimyo himself. Moritaka swords were unique because they were made and used to help attain Buddha hood. Five generations ago, master swordsmith Chuzaemon Moritaka decided to expand and apply our forging experience to knives. Since then we have been dedicated to producing a large variety of kitchen knives and edged tools for gardening, agriculture and forestry. Moritaka Hamono has a history of over 700 years. The knife that you purchase is forged with skills and knowledge developed and accumulated generation by generation. 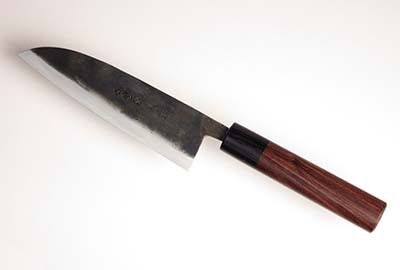 MORITAKA HAMONO brand double-edged knives are made using a “triple structure” technique. This technique employs a method by which a layer of solid steel is sandwiched between 2 layers of soft iron. We combine the characteristics and strengths of both iron and steel to produce blades that are super-hard yet durable. The steel core is hardened using our heat treatment techniques. The iron cladding is not as hard as the steel core, but is extremely long lasting, and is forged with the steel core to provide durability. This technique is the feature that makes Japanese samurai swords and metal forging renowned throughout the world. We continue to handcraft our knives using this “triple structure” technique because we believe it is an essential part of producing the best quality knives. While there are advanced technologies available to produce cheap, mass-produced knives quickly, nothing compares to the workmanship of MORITAKA HAMONO knives.